The most beautiful gift is the ability to create! Hi lovelies!!! I am back, hopefully with a bang. I will spare you the chit chat and jump straight in. 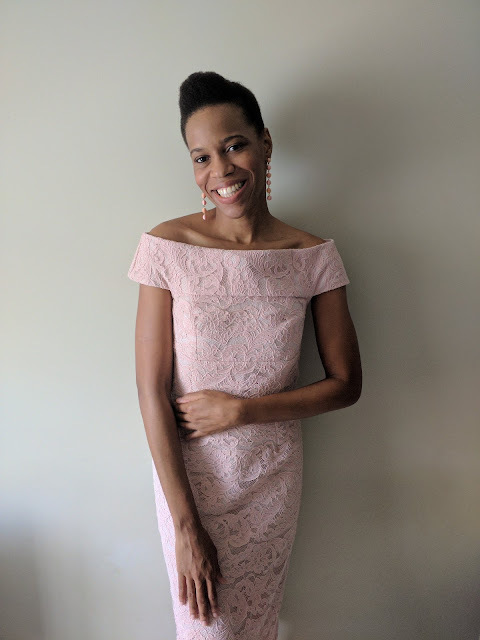 I recently embarked on a journey of fixing my wardrobe after not sewing pieces for myself in a while. There is a deep hole in my closet and most of what I have been wearing needs a desperate break. 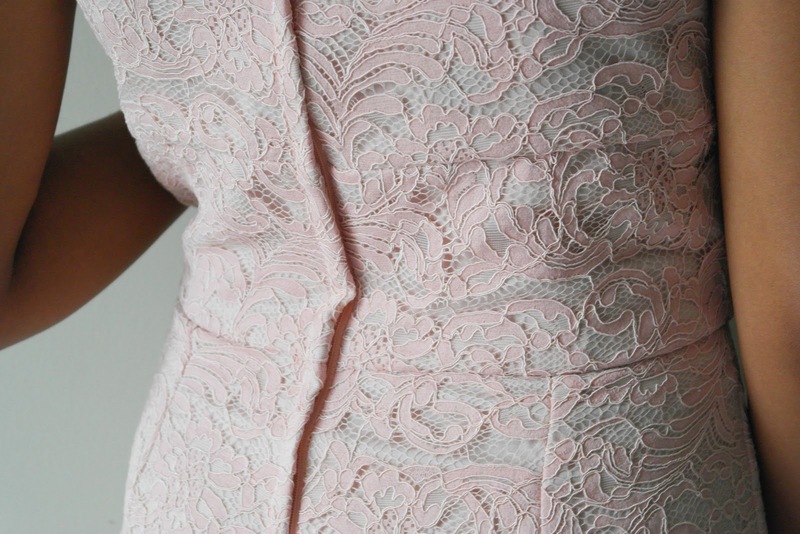 In a bid to get myself some formal wear and church appropriate garments I started with this pink rose lace dress. I am in love! It shows off my clavicles perfectly, probably one of the only things I have going for me, haaaaa....and teeth. 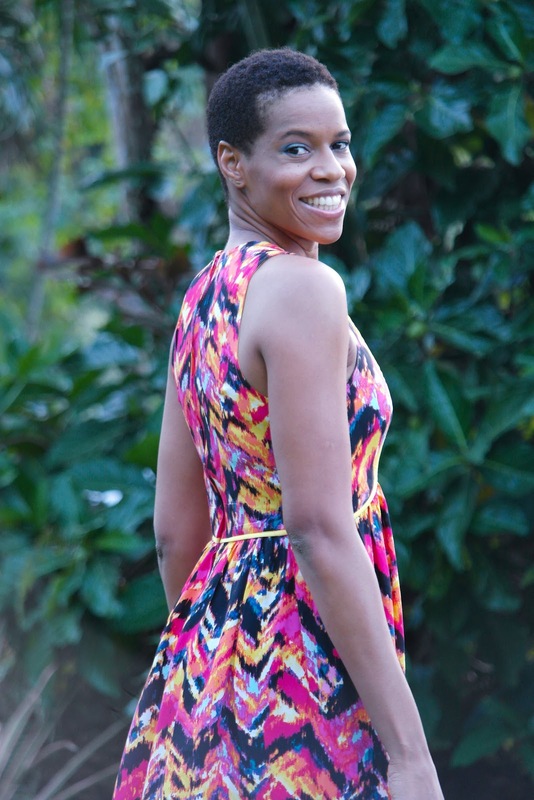 The dress is McCall's pattern M7719 in the off the shoulder bodice and straight skirt. I really liked this view of the pattern and the model really sold it to me. Certainly the usability of the pattern with the other views was an added bonus. 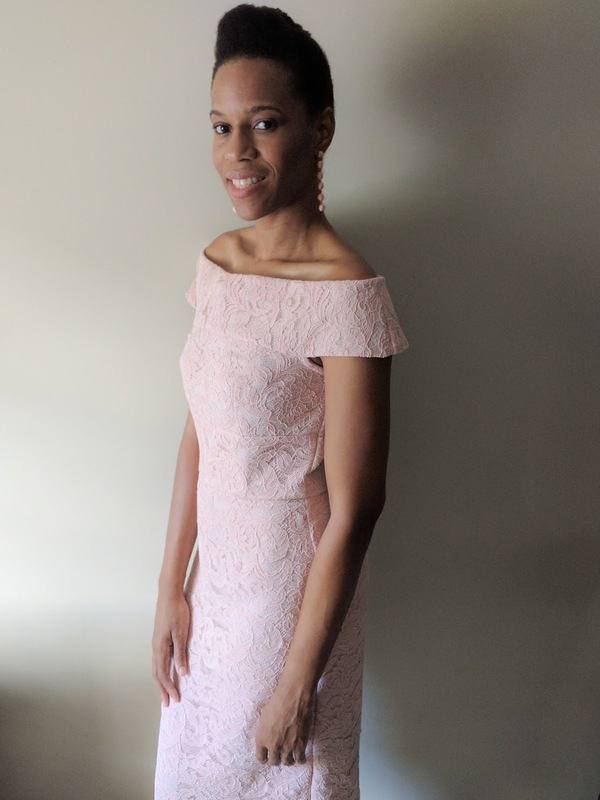 I made the dress up in a heavy corded lace with a satin crepe base fabric. The materials came together and worked perfectly! I did not line the dress as the two layers were already so thick. I would sweat like crazy in the tropics had I lined the dress. I finished most of the raw edges by covering with grosgrain ribbon. Definitely a new favourite method of mine after it was so successful with this project. There were only a few alterations. I raised the armhole about half an inch because it looked so low on the version on the model. I also had to chunk out a huge section in the back seam of the uppermost piece of the dress pattern, about 1 1/2 inches on each side and graded. 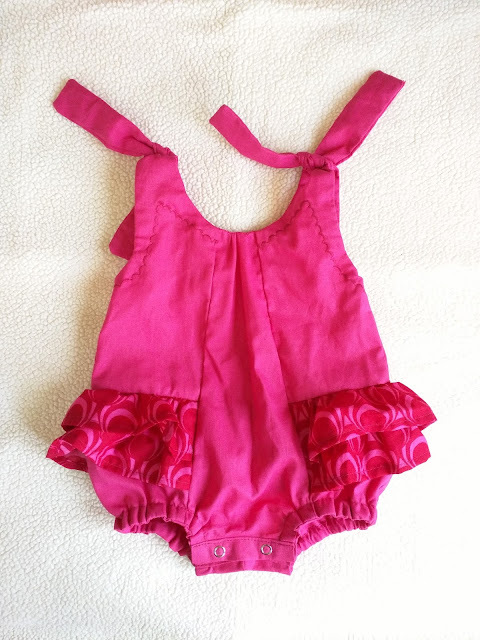 I usually always have to make these alterations using patterns because I have a narrow back. 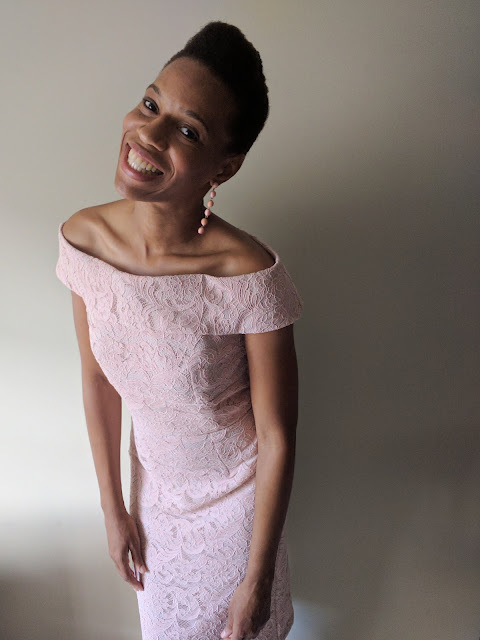 My biggest concern with this dress is that the shoulders of the dress would eventually slide down while wearing it as I am an A cup and so there would be nothing to hold it up. 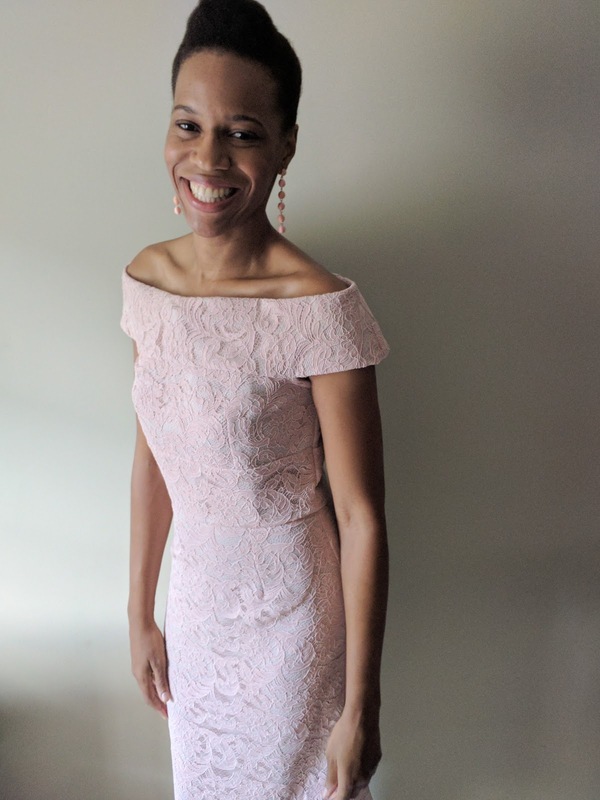 I wanted it to always remain upright and I did not want to feel like I needed to be tugging at the dress while wearing it. To alleviate my fears I decided to add boning throughout the bodice that radiates all the way to the shoulder wrapping section of the dress. It worked perfectly! I just had to make sure they were the right lengths so as to not stick out awkwardly at the top seam. From the pictures you can see that the boning is covered by sandwiching in grosgrain ribbon. 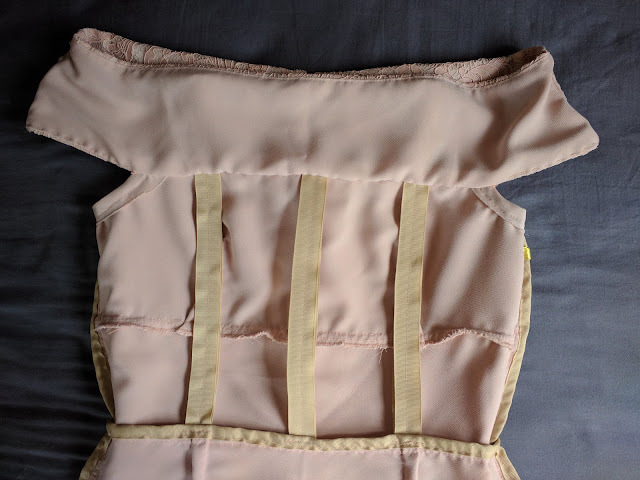 You may also notice that the boning is free floating and is only attached at the waistline and at the seam connecting the bodice to the off the shoulders piece. 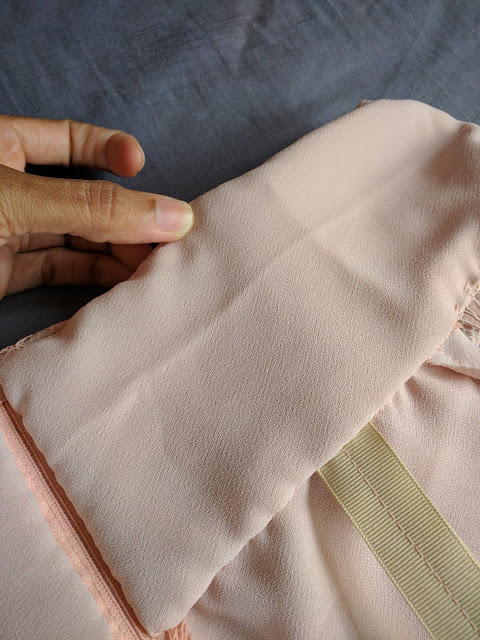 This technique is certainly useful to prevent the appearance of boning lines in the garment, especially if not lined and it gives a gentle form of structure to the garment. So that's it lovelies. Feel free to message me if you want more information on the boning process within the dress and anything else. Thanks for stopping by! Blessing to you always. 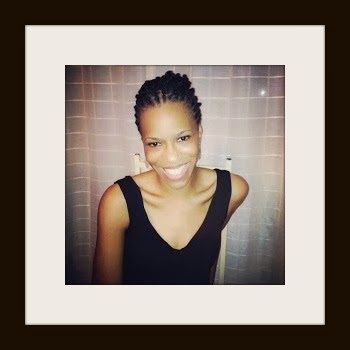 Hi guys, I probably should start back blogging because Instagram isn't everything. It's a great tool especially for persons who are creatives but there is something nice about still writing a full post and sometimes blabbing on about things. I am kind of on a self imposed sewing ban as well so I might just blog about all my undocumented makes to make me feel better. 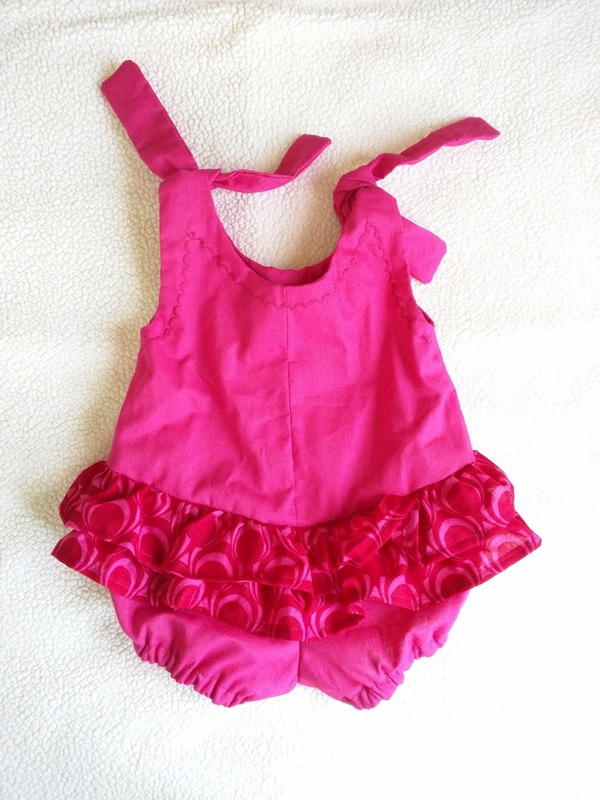 I'll start light with this cute little baby girl romper I made for a soon to be born baby girl of some lovely friends. There is something special about a unique gift and I wish I could do it for every gift I ever give. I simply started to eye cute little outfits on Pinterest and came across a similar romper. It was actually an independent kids and babies pattern company design but I really couldn't bring myself to buying it because even though I support creatives I can't buy everything that I like because I know I am more than capable to figure it out, and well also because I'll be broke. 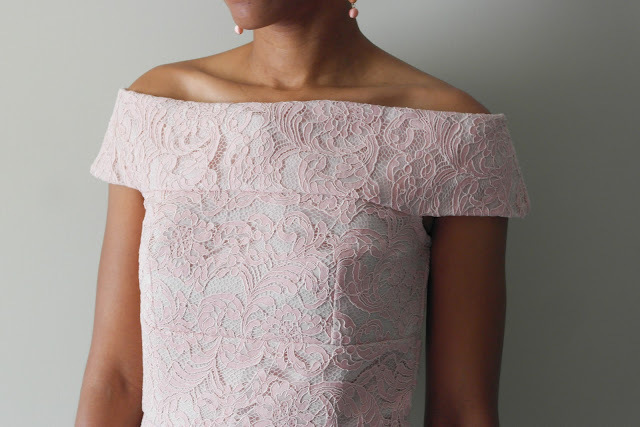 I'm adding the link to the pattern here so that if you'd like to create the look but need a pattern to work with I highly recommend the designer. For all you know my proportions could be very wrong and the baby might get very limited wear out of it...haha. I will spare you the story about wanting a girl baby first! Take care, blessings to you and yours. Hi guys! It has been so long since I posted; I won't even do the math. I've been squeezing little projects in and between my busy schedule but i haven't documented many of my makes. I will try to work on that because years later I'd like to look back and see all the items I've made for myself. Today I'm showing you a maxi dress i made using a Mc'Calls pattern from 2016. 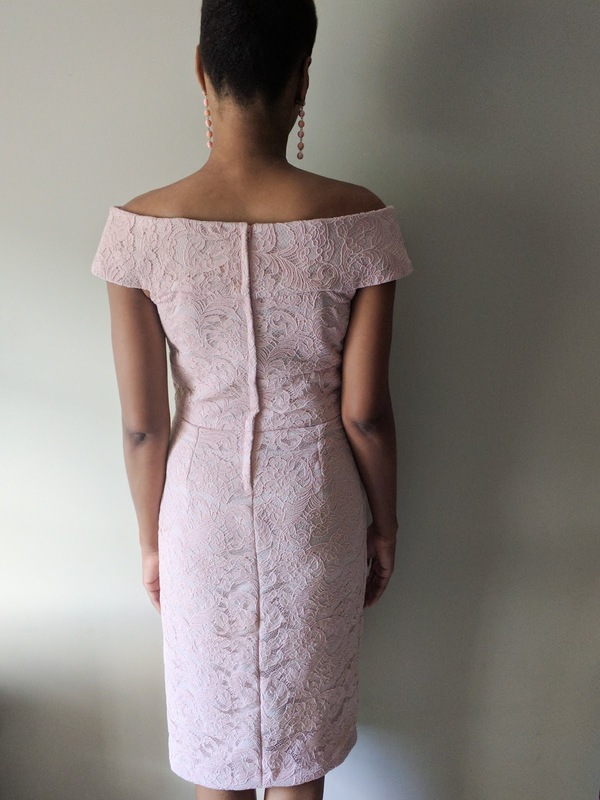 I fell for the design lines at the bust and waistline and i chose to make them standout in this dress and to give the look a little more definition. 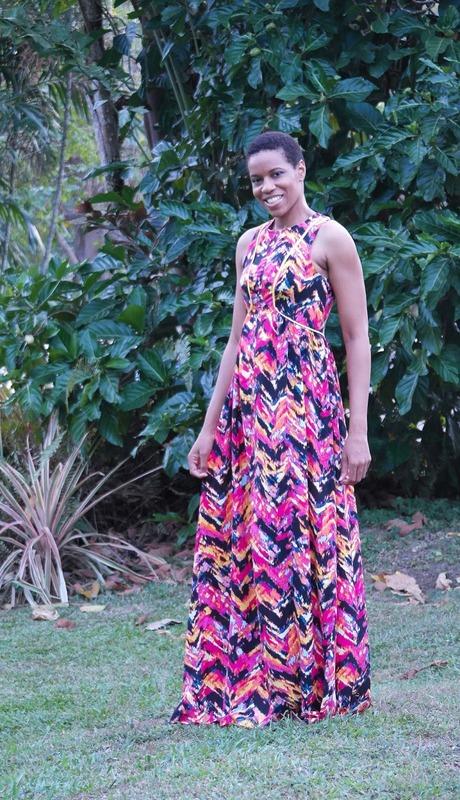 The pattern is M7385 and it comes with a few variations. My favorites thing about some of these patterns is that it has pattern pieces that are specific for cup size so that you get a better fit for your figure. 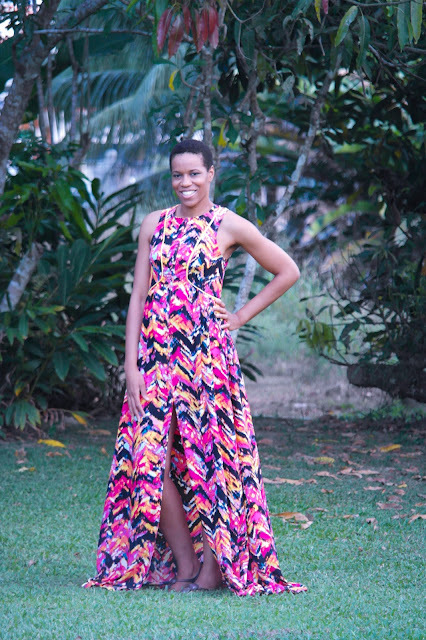 The fabric is a vibrant print from a fabric store here in Trinidad and Tobago called Yufe's. It's so pretty and I'm not usually one for prints. 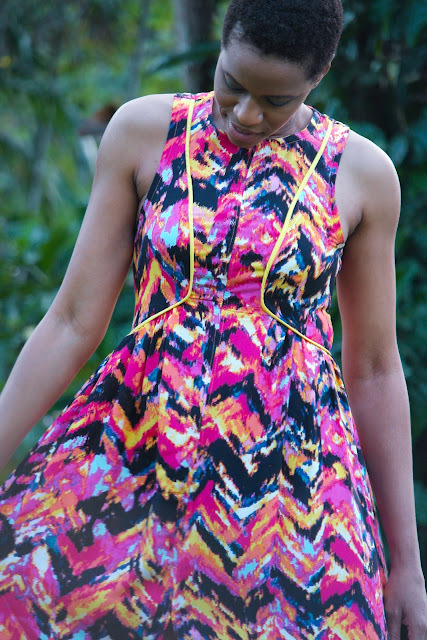 I love the subtle zig zag print and the mix of colours. I believe it is a rayon fabric but i can't be to certain as they don't label fabrics very well here. I made the pattern almost exactly out of the packet. The only changes really were to add inches to the length and to scoop a bit out from the back pattern pieces at the waist and top center back. These are changes i normally have to make with lots of patterns. It was a nice straight forward and easy make. I've been considering my style lately and this definitely falls into 'I like it, but it's not me'. I'm sure that I won't wear it often but I have it now as one of my special occasions outfits. I would consider making this pattern again in a plain dark colour in a flowing cotton. Thanks for stopping by! Blessings to you! 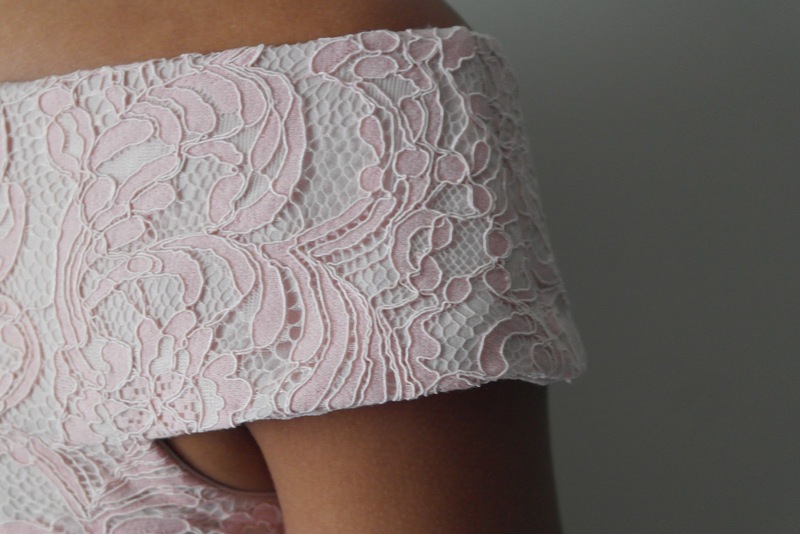 I am an individual who gets the biggest thrill from creating anything, but more so garments. I have been blessed with a great talent and I'll keep using it until I meet my maker. "Has my hand not made all these things!"